Ever Been To The World I Invented? How do you explain to someone how to write about a place that you made up? Or a race that has never existed? How to describe the unexplored or give directions to a destination that you have never been to? 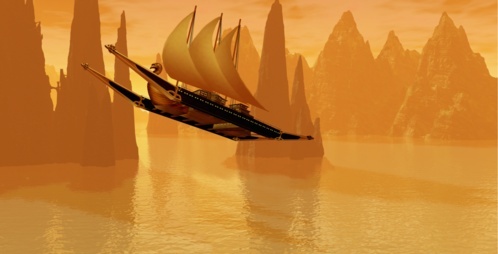 Fantasy (and sci-fi) writers are in a unique position in the writing world. A friend of mine is writing a historical novel from the Vietnam War. It is from a time and place that she never experienced. Yet, thorough diligent research and patient interviews, she has built an authentic account of the jungles, the battles, and the actions of soldiers. We laughed and decided that these were my elves and I could do what I want with them. It was amusing and yet, who sets the rules? The obvious answer is that the market does, and the market is the reader. Buy a fantasy writer a couple of beers and s/he will admit that we all live in the shadow of the greats, with Tolkien being the greatest of them all. In the pantheon upon which the great Ring Writer sits, are others held in great esteem. I am devouring Terry Brooks‘ Shannara series, and so I came across a book he wrote to explain his craft. 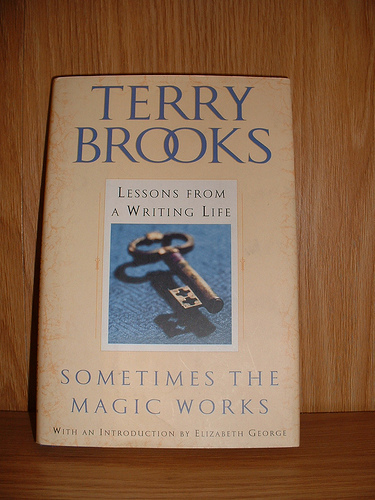 The book is called: Sometimes The Magic Works – Lessons From A Writing Life. Brooks deals with such issues common to all who write fiction such as plot, characters, hook, dialogue etc., but he also spends time on more specialized aspects such as world creating, or even how it is different perhaps to hold the threads of a plot through a number of books or corresponding paths in a single book. I read through Sometimes The Magic Works – Lessons From A Writing Life once, enjoying his autobiographical content as much as his craft teaching. I am going away soon for a week and plan to take the book and reread. 1) What makes writing fantasy different from other genres in terms of craft and technique? 2) Are there other good books on writing that are specific to the fantasy genre? Drop me a note on the blog or tweet any suggestions. I appreciate your help. This entry was posted in Writing Process and tagged characters, dialogue, elf, fantasy, fantasy writer, hook, plot, sci-fi, Shannara series, Sometimes The Magic Works - Lessons From A Writing Life. plot, Terry Brooks, Tolkien, Vietnam War, Wycaan Master.